Remember When Gibson Tried to Market a Hendrix Signature Strat? 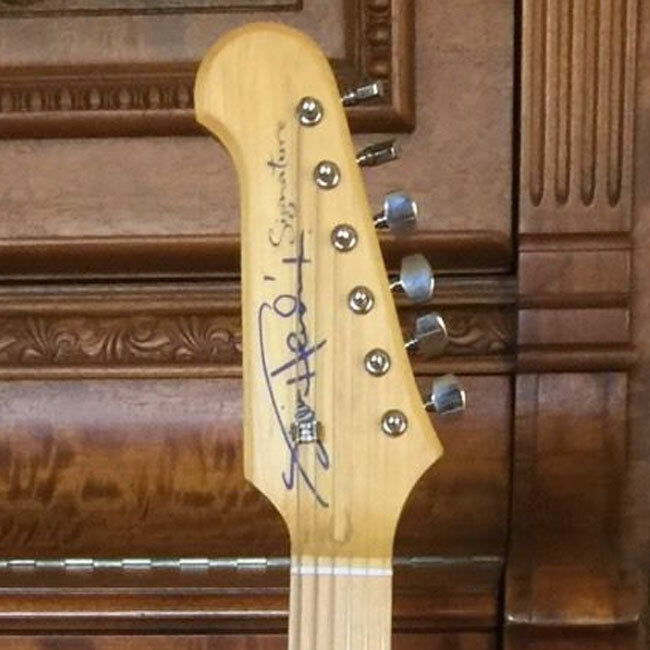 Update, 02/25/19: As you can read below, Gibson's attempt to release a Jimi Hendrix Signature Stratocaster copy did not go over too well with the public. Almost as quickly as they were announced, they were pulled from the market. Only very rarely do they appear for sale. Last week, The Trogly's Guitar Show got their hands on a Gibson Jimi Hendrix Signature prototype package—which includes the guitar, Hendrix strap, guitar cord, pick, and VooDoo Child practice amp. Take a look at their listing for more info. Why baffling? Well, if Gibson had announced a remake of another Flying V, or an SG, or a Les Paul Custom, in the style of those played sporadically by Jimi, then it probably would have floated by as yet another routine piece of product news. In fact, Pat Foley, who was Gibson's Entertainment Relations representative at the time, recalls that the whole idea started with a plan to create a Jimi V or SG that might be produced at Gibson's Nashville factory, following the Custom Shop's successful Jimi Hendrix Psychedelic Flying V of 2006. "Then it got bumped up to upper-management level, and I was no longer involved," Foley says. "When I saw that what was being proposed were super-low-end Fender copies, I was shocked. It was such a poor representation of Jimi's legacy as to be laughable." Yes—the proposed guitars were Stratocasters. From Gibson. Strats in overall style, that is, apart from their headstock shapes and a few tweaks. It will not surprise you to learn that the general reaction was harsh. Let me try to summarize in a relatively polite manner the often vitriolic and sometimes barely printable online comments: "These are Gibson Stratocasters! Jimi played a Fender Stratocaster! How dare you!" The first mention of the new guitars on Gibson's site came that September in the form of an interview with Janie Hendrix, Jimi's adopted sister and the boss at Authentic Hendrix. "It was our idea to approach Gibson in the beginning, after the positive experiences we'd had with the Flying Vs that Gibson made based on Jimi's guitars," Janie told Gibson.com. "Our excitement inspired their excitement, and here we are, creating these new musical instruments. This is just the tip of iceberg. We want to have a whole line of Jimi-inspired instruments." She was asked how the new guitar models represented Jimi's legacy. "His inspiration, talent, and genius at guitar-playing all fueled this instrument's creation," Janie replied. "For one example, Jimi turned right-handed guitars upside down and restrung them. That changed the way the strings and pickups interacted, which created a whole different sound. Now we've incorporated a new design into the placement of the pickups to help recreate that unique sound." The guitars were intended to be part of three starter-type packages: Little Wing (list price $249.99 USD), Signature ($332.99), and Experience ($449.99). You know the sort of thing: In each case, the guitar would be accompanied by a Max Feedback or Voodoo Child amp, a gig bag, instructional DVD, tuner, cable, a Jimi-themed strap, three picks, and a USB stick with "exclusive Hendrix media content." There did not appear to be a plan to make left-handed examples available. 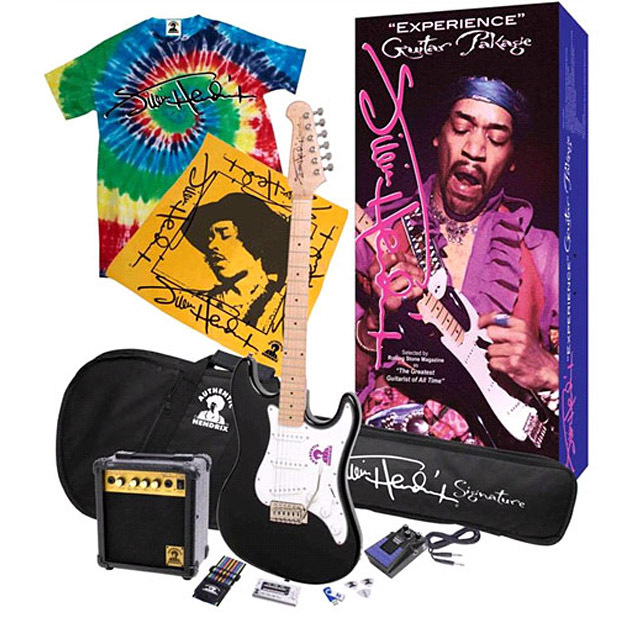 The top-price Jimi Hendrix Experience Electric Guitar Package also came with a fuzz pedal and extra cable, plus a "Hendrix inspired tie-dyed tee-shirt and bandana." Just imagine yourself in front of the mirror with that lot. The very Stratocaster-like bodies of the guitars had Strat-like features, too, although the bridge pickup was slanted forwards—presumably, as Janie implied, to aid those crucial left-handed Hendrix tones. The maple fingerboard was surmounted by a reversed headstock (in other words the tuners were on the lower edge), in two slightly different styles, presumably for similar reasons. Maybe as a result of a huddle with the attorneys, the head did not have a Stratocaster shape. Actually, it was not a new development for Gibson to make Strat-like guitars. The company had produced Strat-style electrics with its secondary brand, Epiphone, since at least 1986 and the S-310 model. That, and others like it, had a very Strat-like body and a clearly un-Strat-like headstock. Fender had federal trademark registrations for a number of its headstock shapes, including the Strat, but earlier in 2009 had lost its attempt to trademark some of its body shapes. From what I can make out of the low-res promo shots that Gibson posted, these proposed Hendrix guitars do not seem to have had Gibson logos or markings on them. In other words, they were Gibson-produced but not Gibson-branded. 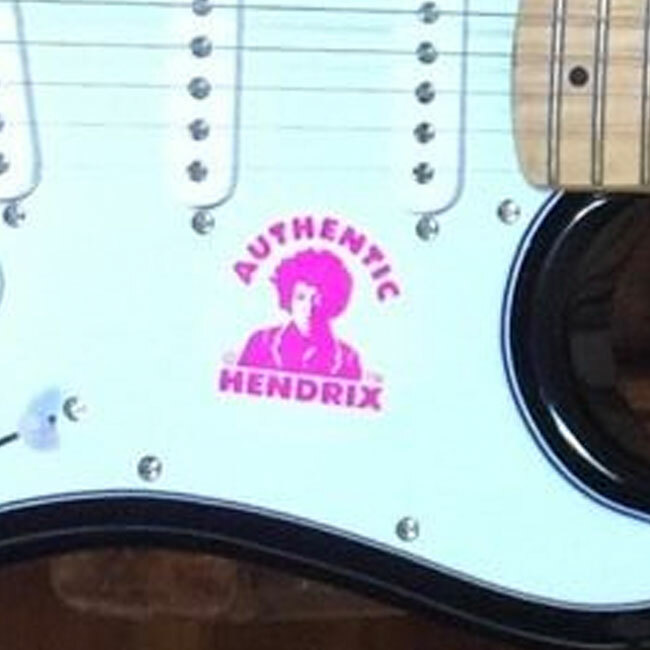 A Gibson.com post referred to an "astonishing about-to-be-unveiled guitar brand," and one of the promo images appears only to have a repro Hendrix autograph and the word "Signature" on the headstock, plus a purple "Authentic Hendrix" sticker on the pickguard. There were also reports at the time of a further higher-end Hendrix Strat-flavored model to be produced at Gibson. However, Gibson or Authentic Hendrix (or both) appeared to change their minds very quickly. Within a matter of days, all signs of the proposed Jimi Hendrix guitars had disappeared from the Gibson website, and that was the last that was heard of them. "Jimi always said not to box him into any genre because it would only frustrate you and him," Janie had told Gibson.com. "He looked at himself as a very unique artist who crossed all the genres of music and reached across all races and to both men and women. He wanted simply to be known as a musician and artist, and his music proves he succeeded in crossing all boundaries." Perhaps this had been a boundary too far. About the Author: Tony Bacon writes about musical instruments, musicians, and music. He is a co-founder of Backbeat UK and Jawbone Press. His books include The Ultimate Guitar Book, Flying V/Explorer/Firebird, and Electric Guitars: Design And Invention. His latest is a new edition of Electric Guitars: The Illustrated Encyclopedia (Chartwell). Tony lives in Bristol, England. More info at tonybacon.co.uk.